The more I listen to this album, the more I love it. At first it was just an obsession with the first single, So Good At Being In Trouble, but now the entire album is on repeat. This is the second album from the American/New Zealand three-piece, and to be honest, I never really picked up on them with their self-titled debut. Better late than never I suppose! The opening track, From The Sun, starts slow and then transforms into this up-beat, psychedelic theme song that is perfect for Sunday lounging. This follows with Swim and Sleep (Like a Shark), which is memorable for the very fact that you won’t even know you’re listening to it (if that makes sense) – it’s just very easy to listen to. The Opposite of Afternoon and No Need For A Leader are bit more gutsy, but UMO’s definition of gutsy is still quite breezy. Monki and Dawn are a bit flat but the album closes strong with Faded in the Morning and Secret Xtians. 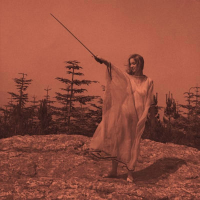 Unknown Mortal Orchestra are playing at the Corner Hotel in Melbourne during July – if it wasn’t already sold out I would encourage everyone to head along. And here’s the entire album on RDIO.